I was very fortunate to be invited by my friend, co-worker and fellow Cascadian Becky to join a desert horseback ride to see the Giza Pyramids. She has been taking lessons at Cairo Horse Riding School, which has beautiful facilities in Giza. Goat traffic on the way to the riding school on a small, country road in Giza. This is not typical of Cairo traffic at all! Although the last time I rode a horse was during a childhood summer camp, I couldn’t pass up an opportunity to experience a different perspective of the pyramids. The owners of the school, Tamer and Jenny, were very friendly and patient with this beginner. Tamer stayed near me and led my horse, Sumayah, a white Arabian. The first glimpse of the Pyramid Complex! I like this picture because of the contrast of the desert on the left and the green farmland of Giza on the right. Especially because I’m not too keen on riding a camel due to ethical reasons, I definitely recommend the experience as an alternative way to see the villages and stables in Giza and the neighboring Great Pyramids. Jenny, me and Becky on our Arabians with the Giza Pyramids in the background. It was a very quiet and peaceful experience. Parts of the desert felt like we were in another world or the set of “Star Wars,” which was filmed in Tunisia, not too far from here, I guess! 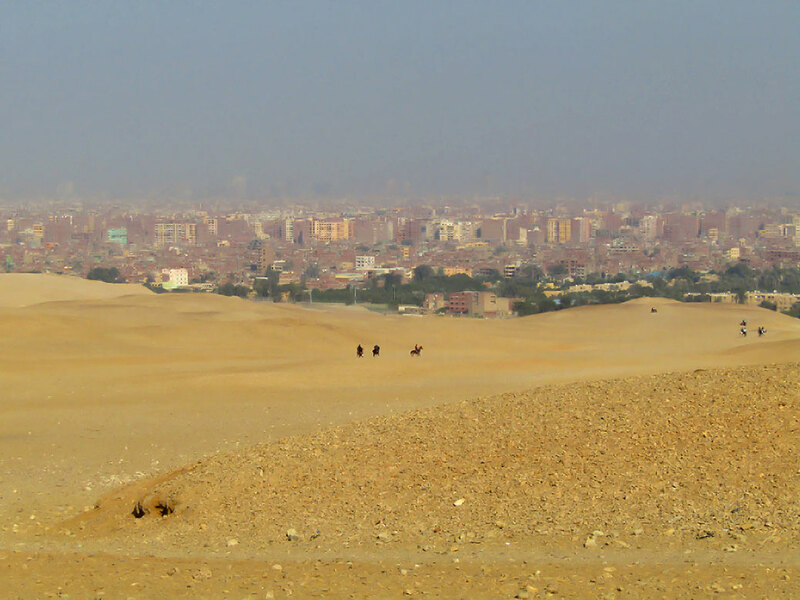 View of desert riders and the city of Cairo in the distance. We saw Egyptian riders at full gallop enjoying the wide, open space of the desert. Because it is December, it wasn’t too hot, but the sun is still pretty powerful. And there was a desert wind, as the sound on my short video reminded me. The desert “café” is a great place for riders to stop and take a rest. Tamer leading the horses to a resting spot. When we reached the viewpoint of the Giza Pyramids, we stopped at a tent, where a man came out to take our order for tea and cold beverages. I could get used to this view and service! And now I have seen the pyramids from the north, east and south (desert). Me with my mint tea enjoying the view. As I get older, I’m less shy about doing new things! 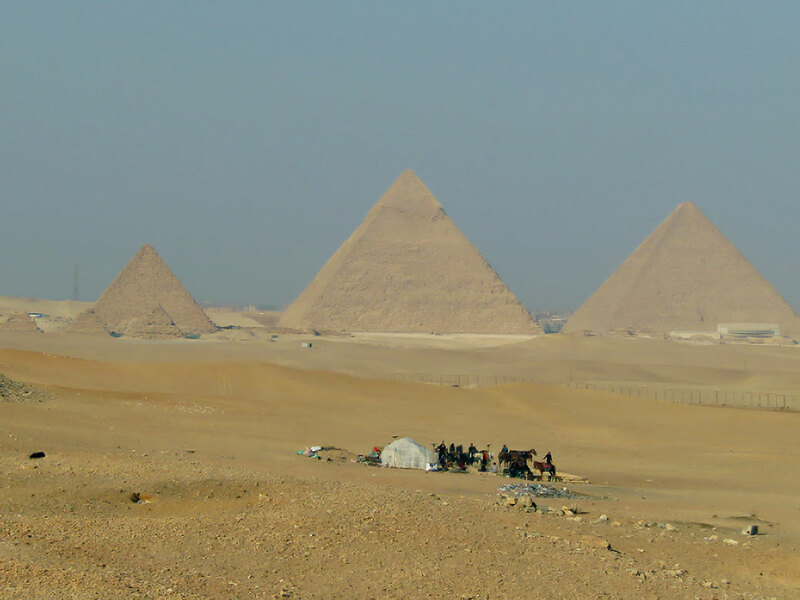 The three largest Pyramids of Giza and the three smaller ones on the left are the Pyramids of the Queens. Thank you for the unforgettable experience. What a fun experience. I’ve ridden horses, an elephant, and a camel. The camel was the most comfortable for sure. What’s your ethical problem with camels? I don’t personally believe in riding animals that are confined or chained for the purposes of tourist entertainment. Camels are not a normal means of transporting people around town. But there are donkeys and horses aplenty!